Short, but informative reviews of songs by industrial/hard rock project The Unravelling, indie rock/pop darling Louise Aubrie, psych-rockers Broken Guru, and garage-pop trio Sharkmuffin. Steve Moore and Gustavo DeBeauville, the Calgary, Canada-based duo behind the industrial/metal/hard rock project The Unravelling, have returned with a 2nd hard-hitting single that is slowly unfolding the story of the dark side of living in this modern world. 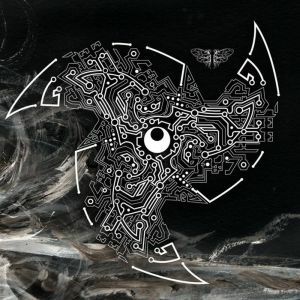 Steve and Gustavo are collaborating with designer and animator Shaun Friesen (http://www.freezen.ca/) for the artwork of each single in order to craft a complete existence for their creations. The foreboding lead single, “Revolt”, had a heavy industrial edge and lyrics that called to break free from what is false in life and to make changes for the better. The next step, “Master Drone”, continues the story of how, as individuals, we have been programmed or groomed to fit certain identities and how our expectations in life go hand-in-hand with the personas we have supposedly chosen on our own. “Master Drone” occupies a similar industrial complexity as “Revolt” and is chock full of stark, vivid, and thought-provoking lyrics. Steve tells it like it is, shouting that we live in a “World of mimicry / Not an original thought.” The near-constant, fast, staccato slam of bass lends the track an aura of danger, while a tapping beat and sporadic cymbal hits mark time. A weaving, whining-siren guitar line cycles through the aggression, with Steve mirroring its pull by rawly, but clearly pushing out his words, intoning “You may be a master drone / but you’re still under control.” At the end of the song, its strict stop-start structure loosens up some with a smoother flow of lighter synth notes in the background, rhythmic cymbals bash, wordless vocal “Ahhhs”, and a lessening of the slammed and spiraling guitars sound. 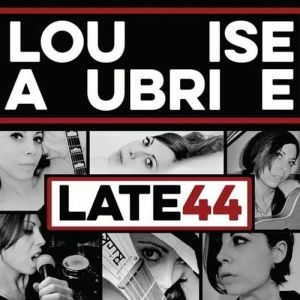 Singer-songwriter/musician Louise Aubrie splits her time between New York and London and in the spirit of this inter-cosmopolitan connection, she offers her third album, titled Late 44, which mixes the grit of indie-rock with the catchiness of pop song structures. Louise’s lyrics-centered tunes are direct and relatable, and similar in style to bands like Elastica, The Pretenders, and Blondie. Late 44 was recorded at legendary Abbey Road Studios and comes out on July 13th. Louise is joined by Tom Edwards on guitars, Boz Boorer on even more guitars, Joe Holweger on bass, David Ruffy on drums and percussion, and James Knight on piano and keys. James also produced and mixed the album at Knight Time Studios in London. The ten-song album is engaging and mainly upbeat, with the most rockin’ number being “Too Late”. It’s a polished, up-tempo, garage-rocker with Louise front ‘n’ center, as always, but this time with her voice lightly run through a processor to give her a tougher sound. The melodic pop side of the tune still shines through with Louise’s short-phrase vocals as she exclaims “All the time / …passionate crime” and “But you love me / - It’s too late!” The one slight downside is that it’s hard to hear Louise’s exact words on occasion. The choppy flow of her vocals and the stop-start pace of the distorted guitars, prominent bass line, drums, and cymbals crash give “Too Late” a lively, abrupt feel that fits in with the rock nature of the song. The psych-rock/garage-rock band Broken Guru is composed of Rich Guerzon (vocals, guitar), Chrisy Fiero (vocals, bass), and Ray Fiero (vocals, percussion) and they are NYC-natives and life-long friends. The trio has recently released its debut album, Bent Up Halo, a sometimes dissonantly shambling ramble, sometimes retro-60s garage-rockin’ hodge-podge of guitar fuzz, kinetic drums, and exclaimed to strained vocals. A highlight of the album is the 60s-steeped psych-rock trip “Half Awake”. Rich, Chrisy, and Ray get the balance right with a harmoniously proportioned mix of instruments, laid-back and more controlled vocals, and an overall mellow-retro tone. The restless fluctuations of rock-oriented fuzzed-out guitars, pronounced bass line, and drums and cymbals simmer are countered with an alt-folk-leaning, picked acoustic guitar motif. Rich sing-talks the main lyrics “Slapped upside the face/ Redesign an escape / Full of spiritual faith / Half awake and so late” in a clear, insistent tone. The straightforward drive of “Half Awake” is kicked up a notch near its end, when a sudden build-up of whirlwind guitars and pounded drums increase the intensity to an exciting level. The members of toothy and toothsome garage-pop trio Sharkmuffin (Tarra Thiessen (vocals, guitar), Natalie Kirch (vocals, bass), and Janet LaBelle (drums)) hail from Brooklyn and have a 7” and 2 EPs to their band’s name. 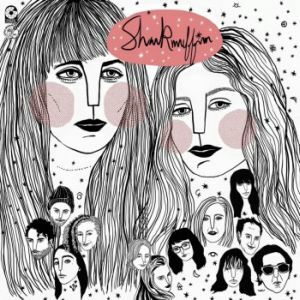 Due to an unfortunate arm injury, however, Janet had to take a temporary leave from Sharkmuffin during the crucial period of debut album-recording, and renowned drummer Patty Schemel ended up filling in for Janet. The debut, titled Chartreuse, with Patty on drums, will be released on August 7th on limited edition cassette and vinyl by Little Dickman Records/State Capital Records. Sharkmuffin has been active on the touring circuit and recently recorded some new songs at Converse Rubber Tracks.